As part of a new series looking at how policy teams within Department of Health and Social Care are using digital tools, we asked Suzanne, who’s currently part of a policy team leading on a digital project, to talk about some of the tools they’ve been using through the Discovery and Alpha phases of their project. Ben Showers (Digital Assurance Lead). My name is Suzanne and I work on the Healthy Food Schemes Team within the Children, Families and Communities branch. My team administers schemes designed to help children and families on low incomes through provision of vitamins, vouchers that can be used to buy fruit, vegetables and milk, the nursery milk scheme and the schools fruit and vegetable scheme. As my first digital project, the Healthy Start digitisation programme threw me headfirst into the depths of a digital tools minefield. So what exactly is Slack? Why do you need Mural? And what exactly was I meant to ‘appear.in’? We dived straight in and began the somewhat lengthy process of accessing all of the tools. This was not without complications such as permissions for downloads, web pages being blocked in Internet Explorer (IE) and lots of red tape to gain the approvals needed to even set them up. Most of the tools would not load on first try in IE and we quickly learned that Google Chrome was our friend. For occasions when computers would not allow (wifi issues as a result of an office move for example), our tools have mobile versions so we were still able to use them. This flexibility was needed at various points and proved to be very useful. Slack was a tool which we used to send instant messages between members of the project team. It acts much in the same way as a Whatsapp group and enables you to send links, have discussions in a group and set up individual threads for conversations with other members individually. 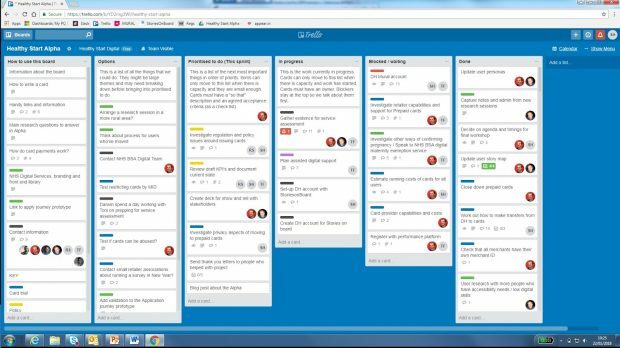 Trello became home for our project. It acts as a fluid project plan that holds all of the tasks you need to complete, and allows you to group them into categories such as ‘to do’ and ‘blocked/waiting’ so that everyone in the team knows the status of each task. You can even assign the tasks to specific individuals to divide the work up, and colour code them according to themes. If you like post its and lists….this tool is for you! Appear.in transformed our collaborative working. In a nutshell it is a video conferencing facility that allows all members of the project team to join the call from wherever they are located. You can share screens, send messages within the call, zoom in to peoples screens to see them make live changes to shared documents in Google Docs. Mural and StoriesOnBoard were less used by the policy team but the contractor found it invaluable to demonstrating the customer journey to help us understand the process. It is a very visual tool and you can export the diagrams to store them for future phases. All in all the tools that we used for this project helped us work together as a cohesive project team even though we were split over four locations. They helped maintain momentum and focused our efforts on the tasks with the most immediate priority. Make use of the favourites bar. This will enable quick access to all of the tools you need and will keep everything in one place, making it easy to switch between them. Get your contractors to help you test that everything is working ok – so that you don’t have issues when your first meeting! The tools we used were all relatively straight forward once we had completed the initial set up. It is NOT as complicated as it sounds (usually). The main lesson I learned during this project was to embrace the tools with an open mind. They can appear intimidating and complicated, but the benefits to the Healthy Start Alpha by far outweighed the fears.